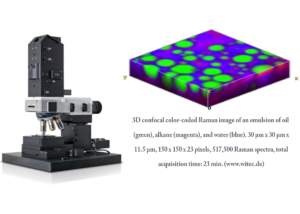 The CCMR has added a WITec confocal Raman microscope to complement its Renishaw microscope in Bard Hall. The WITec instrument has a much higher degree of confocality, with a minimum height resolution of 350 nm and software controlled spatial scanning in 1, 2 or 3 dimensions. Lasers of 532 nm and 785 nm are fiber coupled to the instrument and Raman shifts are analyzed on monochromators with 300, 1200, or 1800 l/mm. The ‘True Surface’ function uses an additional laser to enable the microscope to follow surface profiles. For more detail contact Phil Carubia or see the instrument page here.